Colorful beads, flying feathers and unmitigated fun…Louisiana’s northern neighbor likes to party too and a small Victorian town in the Ozarks celebrates Mardi Gras like no other. Eureka Gras began with a New Orleans native, Dan Ellis seven years ago. To date, Mardi Gras is one of the biggest and certainly one of the most flamboyant festivals in Eureka Springs, Arkansas. The Krewe of Krazo (that’s OZARK spelled backwards) welcomes locals and visitors alike to “let the good times roll”. Don’t miss these crazy activities running January-February. See photos of the 2011 Mardi Gras Parade on Facebook. 1. Catch some beads thrown by costumed riders of fantastical floats as they wind down Spring Street in downtown Eureka Springs. There are two Mardi Gras parades, one night parade and one during the day. 2. Dance with royalty at one of the Mardi Gras balls held around town. Many of them are private so an invitation would be required but look for overnight packages that include tickets or get tickets to the famous Beaux Arts Ball which is open to the public. Don’t worry if you cannot find a ticket. The Mardi Gras spirit spills over into the streets. Swing some beads as you stroll to one of many quaint bars and independently owned restaurants around town. 3. Dress up your furry friend and march with the Krewe of Barkus in the main parade. This year’s theme is Go Gangnam! Get costume ideas and see the official poster or contact Rachel Brix at Percy’s Grooming & Pet Spa for more info on the pet parade. 4. Join some Freakin Eurekans on the Krazo 2nd Line Krawl then roll out of bed for the Sunday Jazz Brunch. Read more about Eureka Gras Mardi Gras. Find a place to stay. ReserveEureka.com lists festival packages and last minute specials which are updated daily. 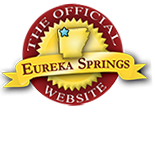 See Eureka Springs lodging and check the Official Eureka Springs Calendar of Events for more details and times. Grand Central Hotel includes 2 nights in Luxury Jacuzzi Suite 2/8 & 2/9, dinner for 2 at the Grand Taverne Restaurant and 1 hr couples massage in the Spa just $429. Call 800.344.6050 from 9am-9pm to reserve. 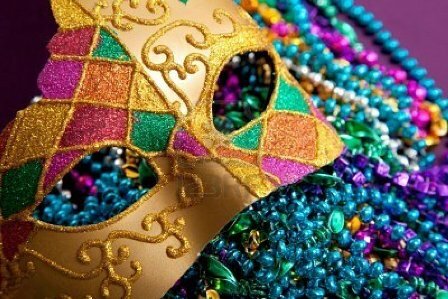 Basin Park Mardi Gras Package is a 2 night stay with 2 tickets to the Beaux Arts Ball and Jazz Brunch. This entry was posted on January 16, 2013 by estcblog in Arts & Culture, Basin Park Hotel, Festivals, Fun Downtown, Things to Do and tagged Arkansas, dining, downtown, Eureka Springs, Eureka Springs School of the Arts, historic downtown, history, local culture, Mardi Gras, Winter.